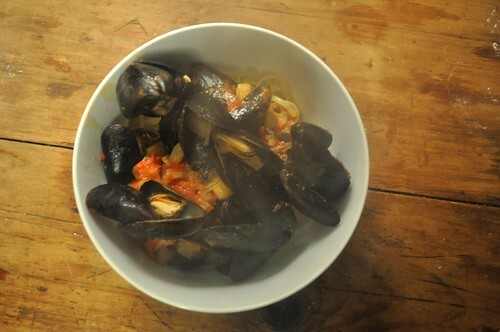 On Sunday night, I made Greg’s favorite, mussels. I have to admit I am not the biggest fan of mussels but I love mopping of the juices of the stew with a fresh baguette or some linguine. I picked up a few pounds from Maine on sale at Whole Foods for $4.99. I’ve been dying to try them using fennel steamed with Pernod—a french absinthe flavored with star anise and other herbs. The fennel made the whole kitchen smell of black licorice. 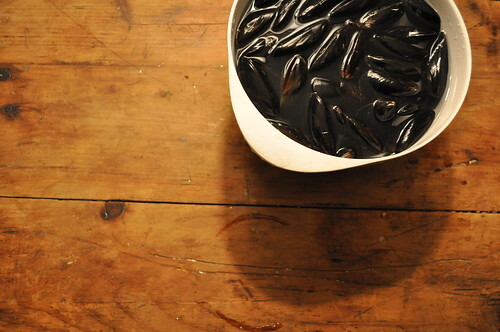 On a cold winter night mussels are a wonderful and inexpensive feast. Cheers! p.s. I had leftover tomatoes so I made a similar sauce tonight. Used onions instead of fennel, fennel seed, smashed garlic, pernod, tarragon, and added olives. Seared chicken breasts on the bone in my cast iron pan and then added the ingredients for the sauce into the pan and finished in the oven. Perfect tonight for dinner (monday night). Greg loved it. 1. Place the oil in a large pot and turn the heat to medium; 1 minute later, add the garlic, fennel, fennel seeds, liqueur, and tomatoes and tarragon if you’re using them. Bring to a boil, cook for about 1 minute. Add the mussels, cover the pot, and turn the heat to high. 2. Cook, shaking the pot occasionally, until the mussels open, 5 to 10 minutes. 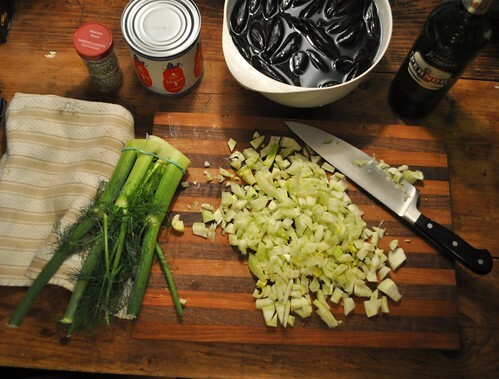 Use a slotted spoon to remove the mussels and fennel to a serving bowl, then strain any liquid over them and serve. Recipe adapted from Mark Bittman, nytimes.com. You’re so lucky to live near the water so you can get fresh seafood! Looks tasty! jen, Oh good! I’m so glad you liked the recipe too. I’m sure they are good the next day as long you properly stored them overnight. Katy, the mussels were a hit! Thanks for the tips! I cheated and used white wine, since we have loads from our housewarming party, and I don’t have any Pernod. We ran out of steam before finishing the 4 pounds, so I’m wondering if mussels are ok to eat the day after? Mussels for lunch? I’m definitely digging into that delicious broth for sure. Since you now have a bottle of Pernod, I have a delicious and simple recipe that uses it. Saute shrimp with chopped garlic in olive oil and butter until slightly underdone, remove from pan and place in a shallow baking dish. Add a 14oz can of diced tomatoes, a few capers, some oregano and red pepper flakes and cook down a bit. Pour over shrimp, top with feta cheese, sprinkle with Pernod and bake for 15-20 min. this looks so yummy! i’m definitely going to try it! FYI, Crosby’s has PEI mussels on sale this week for 1.99/lb. We’re probably going to have them every other night! Sounds positively delicious! Being native NYer, I’m constantly frustrated at the lack of really good, inexpensive seafood here in land-locked Utah. Hopefully we will be back east before too long. Jen, Tomato soup with Fennel sounds lovely. Nancy, I have a nikon d5000. I have a link to specs if you scroll down the page on the left. I don’t really have any photo tips. I am a beginner. Just shoot what you like and be patient with yourself. 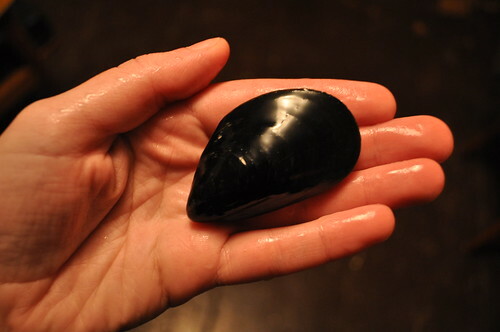 Katy, your photographs are so gorgeous I can almost smell the mussels. I too have been cooking with fennel, but mostly with fennel pollen, which is the most pungent and perfumed of the variations of fennel I have tried. Would love to know what kind of camera you have or if you have food photo tips you would share. Thanks for the great posts. these look delicious! I love mussel broth and this sounds so good. So funny, I made tomato soup with fennel last night (with fennel seeds and san marzano tomatoes, too!) — also on a fennel kick.